Very often, relationships are riddled with confusions and uncertainties. We, as humans are prone to having some doubts about our partners. They may be borne out of insecurity or miscommunication, but they do exist and there’s no denying that. And these feelings of uncertainty make us uneasy and we need constant validation and proof that we were not mistaken in choosing our partners. Having such feelings of doubt are nothing out of this world and you’re definitely not alone if you think like that. You feeling he’s (your partner) not convincing enough when he says he loves you, or what he does to express his love isn’t enough is very natural. These feelings are present even when your relationship is going smoothly. You might be getting more than you expected but these feelings are still somewhere at the back of your head and may keep you up at night. 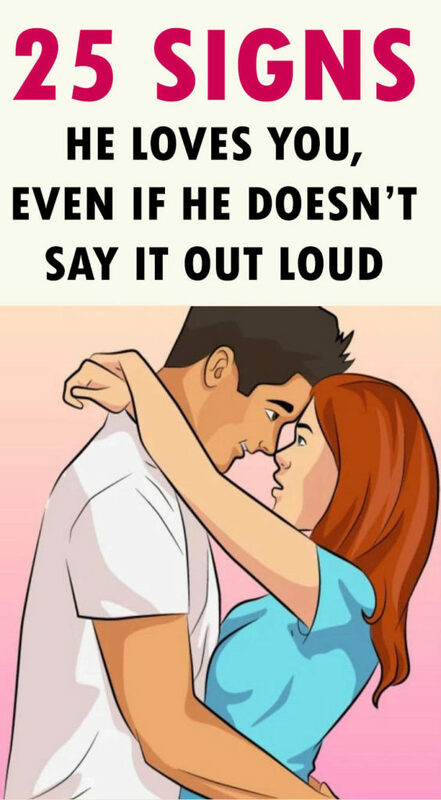 But rest assured, he may not be voicing his feelings very openly, but there are subtle ways to find out if he really loves you. It’s the actions that usually speak louder than words. Here are a list of 25 things that might just prove that his love for you is eternal. A sure sign to know if he’s really into you is his want to spend a major chunk of his time with you. Especially his free time. If he insists on making plans for the times he’ll be free, it surely means he really enjoys his time and has nothing better to do than be around you. He sees you with him in the future and that is why you’re always a part of his future plans. If he’s treating you like somebody his equal, especially at the times he’s considering some decision and wants to know your opinion about it. It means he really values you and respects what you have to say. And respect is the surest way to know if he’s a keeper or not. 3. OUT OF SIGHT, OUT OF MIND? NEVER! He’s surely not clingy when it comes to you, but that doesn’t mean he’s completely forgetting you either. He habitually keeps checking up on you, only to make sure you’re doing fine. He does things for you, and showers you with gentleman-like gestures all the time without feeling the need to remind you about it. And topping it off, he doesn’t even keep a record of all the nice things he did. This really shows his selflessness and the surety that he thinks you’re worth all that he does. If someone really cares about you, he will always make sure that he’s honest with you. He never lies to you because he knows that lying will only cause doubts and hurt and he doesn’t want those in his relationship. When somebody is really in love with someone else, they never put themselves before their better half. They’re always willing to give up their wants and needs for their partner’s. If your partner doesn’t make the fights dirty, and always looks for a rational way to solve the problem. This means he’s looking to end the fight rather than making it worse. He wants things to go back to normal because he can’t bear the thought of losing you. If he really loves you, then that means he loves your entire being, not just your looks or those amazing clothes you wear. His love for your personality is the only kind of love that’s meant to last. He will be interested in you as a person and will take genuine interest in what you do and how you are as a person. Those who are really in love with us can’t fathom the idea of harm coming our way. They’re protective to the point of being irritating, but that’s just their love for us. If your partner is in love with you, he will make it a point to not look for attention elsewhere. He will understand that getting attention from elsewhere will be disrespectful to you. It’s always great to have a guy agreeing to all you say. But just make sure he’s not over-doing it. If you’re in a relationship with a yes-man, you might be in a relationship that’s not sincere. He might be agreeing with everything you say for some ulterior motives. Be careful. If he’s confident about the relationship, he wouldn’t be afraid to show public displays of affection, be it as simple as holding your hand. This is a reassuring factor that always guarantees sincerity. They will consider your plans and commitments before making any plans. And will never take you for granted when making any plans. They understand that you have a life too and so will make time accordingly. They have a healthy amount of jealousy that they exhibit. And will be bothered when you’re getting attention from someone else. They invest in you, not only monetarily, but in your personality as well. They take time out for you and share their life and great with you. Taking time out for you from a fast-paced life really shows their intentions are sincere. They’re the same even when you’re not around. Their behavior never changes which shows that they’re the same person and is entirely sincere. They avoid using the phone when you’re around because they don’t want their attention to be divided when they’re around you. They make it a point to match their interests with you so you can both spend more time together and share experiences more often. If he smiles whenever he looks at you, this surely means you’re lighting his world up. And that means he’ll never want to leave you. When they care about what you think, they will try to impress you and that’s extremely important in a relationship. They have a good memory when comes to things you say because they’re always listening to you carefully. It is the greatest form of respect anybody can give you. The right person for you never thinks or expects you to do a certain kind of work. They share the work that needs to be done and divide responsibilities. Out of respect for you and for want of sharing more experiences. They use ‘we’ instead of ‘I’ or ‘you’. That shows how they view the relationship they have with you. If they give you a nickname, it shows they are really in love with you and you matter to them.